* Eau Illuminee kicks off with a refreshing and bright lavender, with a bit of light citrus floating in. * It starts to get sweeter and powdery with the lavender still in the forefront. I also get some nose-tickling herbs that prick the sniffer. * The herbs stay in the mix as a light tonka comes in with vanilla and some rooty, earthy notes. * The base is sweet resins with the earthy notes grounding them. * Longevity is about average, for an EDT at 3 hours. Summary: Clean is often used as a bad word amongst fragrance lovers because it refers to a generic, clean scent that is weak and mundane. 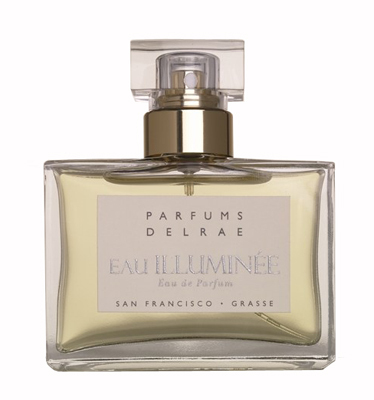 Eau Illuminee is clean how I imagine it being – fresh, with a bright energetic feeling to it. This would make a great office fragrance for guys or girls, provided you carry a spritzer to refresh yourself after lunch. What better way to pick you up for the second half of the work day? Parfums Del Rae fragrances are available through LuckyScent and Parfums Del Rae website. Disclaimer: Sample provided by publicist for review. Image courtesy of Parfums del Rae website. Thank your for this review. I’ve been looking for information about Del Rae scents.